How can I reuse or recycle old glass blocks/glass bricks? | How can I recycle this? If you can drill holes in the middle area (where the two halves join) perhaps you could fill them with different coloured sand for a indoor or outdoor decor item. The seal the hole you drilled with a drop of silicone to prevent weed seeds entering. If anyone wants fresh air and has no access to a garden we could try gardening tgther at my allotment in Parkside Beeston, Leeds LS11. I have disabilities and know the pain can be too much at times. 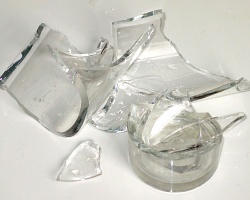 If you have any cracked glass bricks you could use them as Christmas decorations by putting lights inside. You’ll probably find that the cracks will add more sparkle. To make them look a little more Christmasy you could put holly or tinsel round the bottom. Clear glass is perfect light decoration. If you could stack them fountain with lights drapped on top or inside the drilled holes. Maybe some how have each one made into chaneliers..maybe drill a hole on all sides. Then have a strong metal or rope even hanging like a tear drop. They have glass paint you can shear the glass part all sorts of colors…its very pretty in the sunlight. Then comes night you could even put candles real or fake ones and sit them on top of cubes. Three in one deal…just make sure they can hang and wont fall. I am not sure if my ideas have helped. I have not ever had any of cubes, but seem like you could use them for a various things. You could use them to make a small herb bed? raised flower bed perhaps or a wormery!! Great idea! Now I really want to create an herb garden from glass bricks! 1.They make great book ends. 2. Also, if you run over them some wooden planks, you can make several bookshelves on top of each other. 3. Stack them on top of each other for an instant side table. This is not an especially decorative idea, but I have always wanted to reuse glass blocks to make the south edge of a cold frame/mini greenhouse. At my latitude, 47 degrees, a wooden edge on the south side of a cold frame casts a shadow that reduces the useable space in the frame in spring and fall. The seedlings don’t get enough light in about the south third of the box. I would line up the blocks to make the south edge or even the whole box if I had enough of them and top it with an old window. I think making a greenhouse of glass blocks is a great idea; the glass may not be lucid, but its artistic, and preseves one’s much valued privacy. I’m being cheeky – if anyone has any glass bricks/ blocks spare, I’d be eternally grateful for some!? I’m making a make-shift green house for my cucumbers, marrows and tomatoes right now, but thick, and therefore, more heat inside the house would be far better. I have no car, so delivery is needed, and I could offer blackberries apples and other produce in return. Milan 07982 404 968, or better still email: milanholbeckestan@yahoo.com as Im half deaf. Re-Use is always better than recycling! Here’s to the all the earthy, and celestial, beings of recycling, and generosity. I got one made up to look like a Christmas package last year from my sister-in-law. The glass cube is in 2 halves put together. She put a string of Christmas lights in it with the cord hanging out to plug in. She put pretty fabric ribbon around it with a matching bow. It looks very cool under the tree lighting up by the real packages. Incorporate them into your fence. 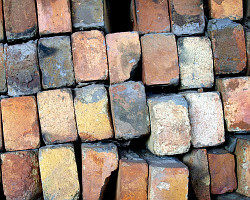 Use such bricks as a weight when fermenting fruits or vegetables in a barrel. Not really in the spirit of things I know, but these do have a pretty good salvage value – I’ve seen them in reclamation yards and they’re not cheap! If you wanted to decorate them you could stamp on them with a permanent ink like stazon and use glass paint to colour them – they would make great Christmas decorations with a candle or LED light behind it. Spray paint it and use as base for figurine or sculpture, or candle holders. Being a successful ‘pavement recycler (really good items just thrown out, even clothes. These are washed/cleaned and then end up in a charity shop) I found a glass brick and find it invaluable as a door stop for the kitchen door leading to the garden in the summer, when the door needs to be left wide open. Heavy enough to withstand any wind. I have also taken home the innards of pedal bins which make good containers for recycled tins, plastics and paper; tall and slim enough to take up little space under a worktop. You could make a decoration for holiday from them. You can put flowers in them or even lights for Christmas. You can put them in garden decoration, too. There are thousands of ways to use them. Greetings! I’ve read all the comments and I agree that using the glass bricks as decoration is a good idea. If I have free time and some extra money to spend, I’d inwall those block glass in my bathroom. 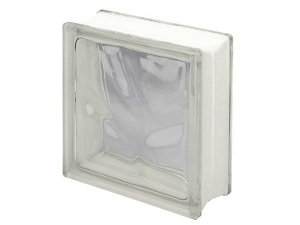 Good idea is to place Christmas lights inside of the glass block. The cracks will actually add more sparkle. If you want to add more to the decoration, add other decorations around the bottom outside of the glass block, such as holly or poinsettias. The idea works very well in small spaces, such as a bathroom or bedroom. It can be used outdoors as well, as long as you’re using lights made for outdoor use. I really like the idea to reuse the glass blocks for Christmas decorations. Christmas is coming so I should try it.